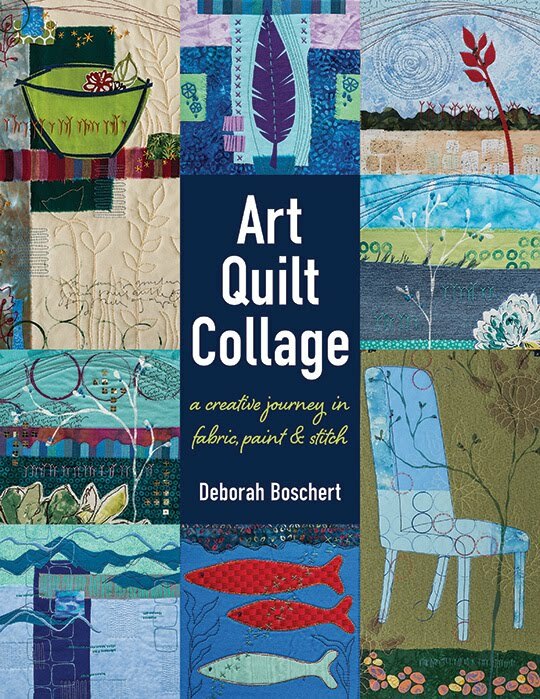 Would you like a peek into the process of my SAQA donation quilt? I like to support SAQA with a donation to their annual auction of 12x12 quilts... but it's always a really difficult process. For some reason, it creates more worry and self-doubt than working on different kinds of projects. Why is that? I am plagued with the pressure of putting out work that really represents me well. Especially with SAQA where I would be in the company of so many other successful, prolific and amazing artists. And there is the additional worry of whether it will sell and for what price. Ug. Let's be honest, I watch the SAQA auction closely and I love to see what work is sold on the first day and what work lingers. Surely, I'm not the only one who does this. I know it's not a competition. I know my art and my self-worth are not measured by this event alone. I know it is not the single sole representation of my personal style and body of work. But still... it feels like a big deal. 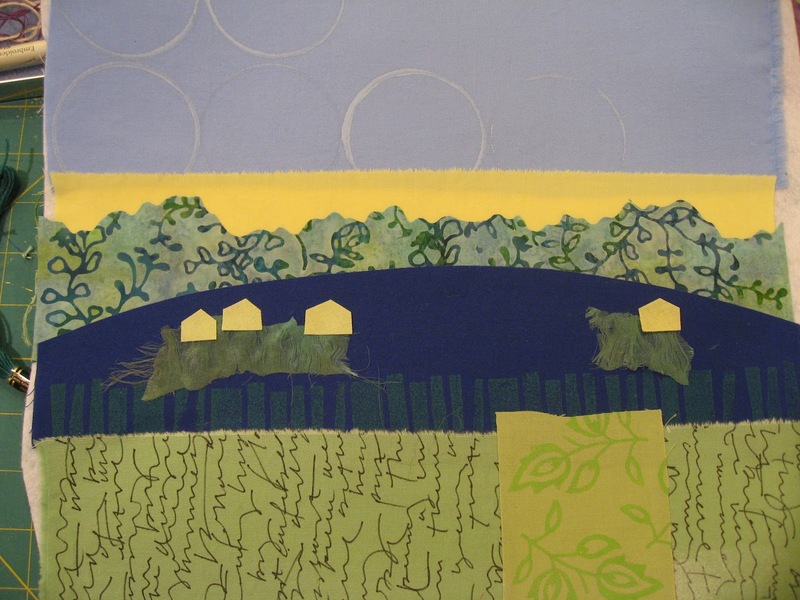 I began by gathering several fabrics to consider for a "layered landscape collage." I hadn't decided to take step-by-step photos as I began the composition, but eventually I ended up with this. Then I decided to add some tiny houses and some torn bits of silk. Should the houses be yellow? Or blue with polka dots? Next, I decided I wanted to add a budding twig shape painted over the design. I sketched the design on freezer paper, paying attention to where each branch would cross over various elements in the design. Then I cut it out with an exacto blade and ironed it to the background composition and began painting. 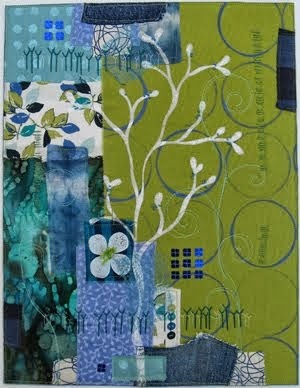 Then I added just a few blocks of interesting fabrics to make it more of a collage rather than just a landscape. See the teal plaid on the left at the bottom and top? And two bit of light blue wool felt. I am also checking the size and layout of the design within my trusty 12x12 window. 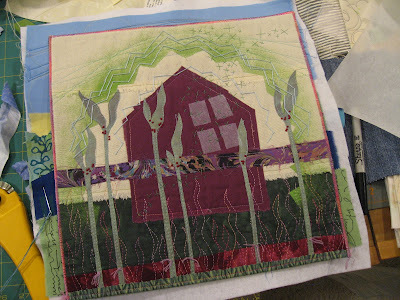 You can see I also stitched a few lines across the top in a graceful arch... as I am want to do. then tore away all the tracing paper leaving the stitched line. Honestly, this is when I began to grumble. I was not happy with the blue stitched shape. You can see I also removed that plaid fabric and the felt squares, thinking they didn't really make sense. But I still felt like it was lacking something. I began adding some hand stitched elements. I did my Y stitches in yellow across the green in the foreground. They don't show up too well. Is that bad? Or just subtle? With the deadline fast approaching, I considered submitting this 12x12 quilt instead. It's already completed. There are lots of things I like about this piece. Back to the blue and green piece. I figured it might improve with some more hand stitching, so I began with this blue floss. Then I ripped that out because it was too fat, too dull and didn't contrast enough with the blue background. I considered using some variegated rayon thread instead. I did choose one of those shiny threads, but I was still not feeling confident. So I had a bowl of ice cream with some chocolate syrup and strawberries. With clearer eyes and clearer head in the morning (of the day it had to be mailed in order to make the deadline), I added more hand stitching and gave it some gentle massaging to make sure it was ready for the auction block. (I offered myself a gentle pep talk, too.) I trimmed it up. Then decided it needed just a bit of interest and contrast at the edge. So, I fused a strip of teal print over two spots. I'll share some detail shots with you later this week. it's lovely! Thanks for sharing the story! I so enjoyed following your journey. I loved hearing your thinking out loud as you worked through the design process. The result is pure Deborah and a great little piece. I am sure it will not languish long on the SAQA auction site. I like it! Thanks for sharing your process. Thanks for sharing the process. Your work is always so strong and delicate at the same time. SAQA - SAGA - love it! Didn't want you to think the humor wasn't noticed appreciated! Thanks for the glimpse into your creative process! Great post! I also waited until the last minute to get mine in. I had over 25 pieces done in 12 x 12 size from which to choose, but I did not think any of them were good enough! I did finally commit to a gelatin plate print piece. I like it, but wonder if it reads well on the website. And... ta da! It's mine!! I am so happy to have your most awesome quilt in my collection.